Coin was recently acquired by FitBit, and they have ended manufacturing and sale of their Coin 2.0 device. This means you will not have any support with Coin going forward, and will also not be able to replace the battery once it runs out. I would recommend that if you’re looking for a similar product to check out Plastc (EDIT: 07/17 – Plastc has declared Chapter 7 Bankruptcy and will not be delivering a product.). 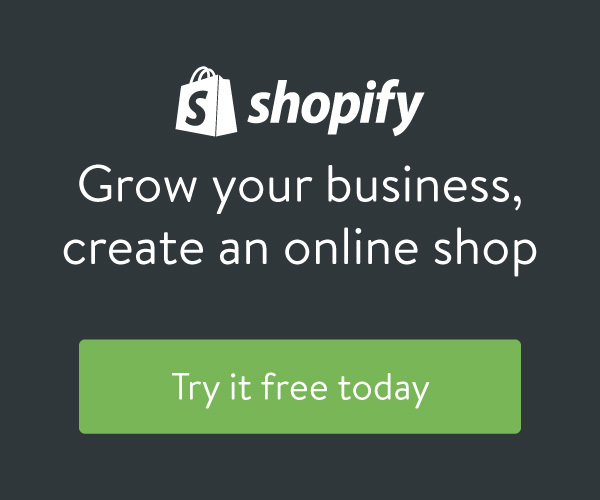 They are very similar to Coin and are offering a trade in program for a discount off of their device for those of you who have already received your Coin 1.0 or Coin 2.0 device. I will be keeping this page up for nostalgia sake. 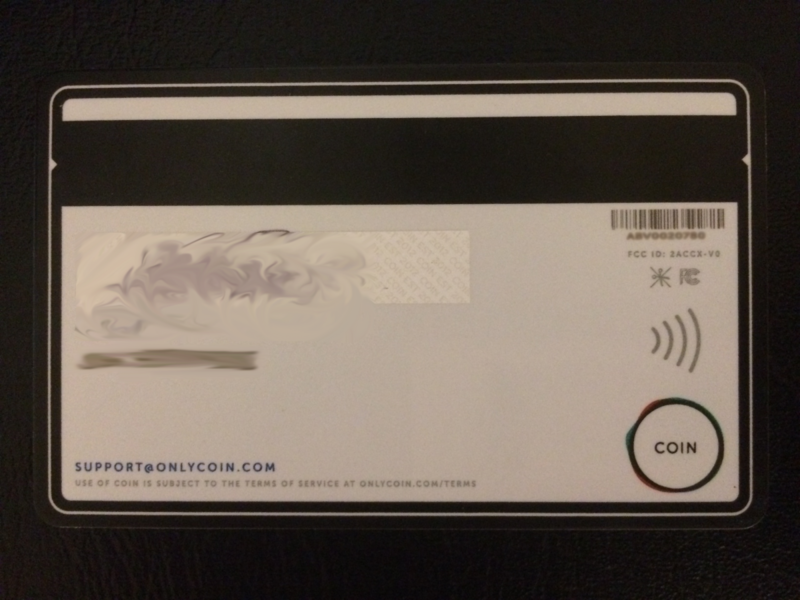 It’s been a rough road for the folks over at onlycoin.com – who make the Coin card that has been plagued by constant struggles with their production and delays, which caused the product that was suppose to be shipped back in the summer of 2014 to be delivered in fall of 2015. Because of the delays, I was automatically upgraded to the 2.0 version for free (nice!) and just got the card a few days ago. If you’e unfamiliar with that what Coin is, you can check out the promo video here which shows the actor using the Coin 1.0 version, which works similar to what I be reviewing today. 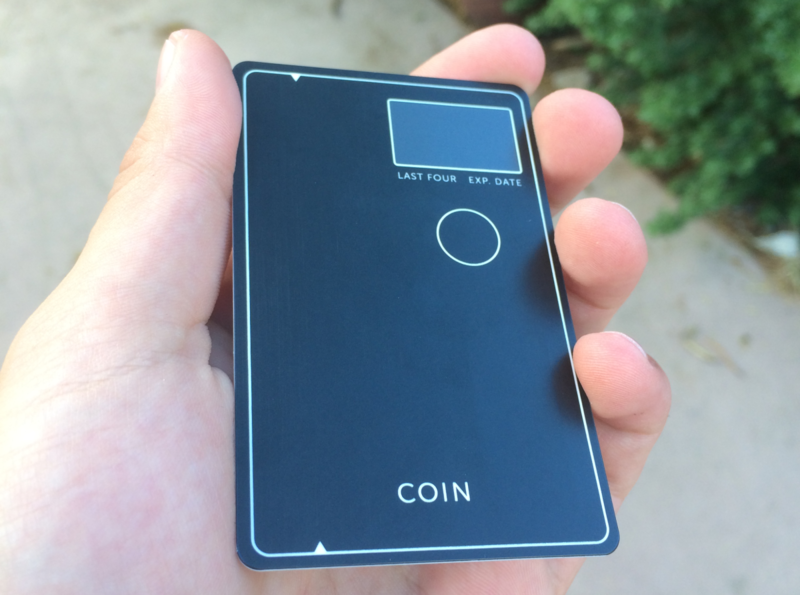 The coin itself came in a nice white box that reminded me of an iPhone the way it was designed – it also came with the card reader and some documentation on quick setup – most of what I had already or read about in the get started guide that the creators published months ago. Lets start off with the awesome features of the card and why it’s a real eye catcher. To start: The card looks really cool. The black with white outline looks like a credit card but throws off all the cashiers because they don’t see any numbers on the front. This can be an inconvenience to some people who don’t want to small chat and would rather just pay and be done with it, but all of the places I have used the card flat out asked me what it was or at least made a comment about cool it was. That’s a nice feature if you want to be known as the cool tech kid on the block, but read on to hear why this can sometimes backfire. Adding cards to Coin is incredibly simple because they send you a card reader similar to the one from Square. Instead of having to type in each and every card number and expiration date, the card swiper does it for you, you just need to fill in the CCV code and the PIN (if you’re adding a debit card). I especially liked this because I have a ton of cards, and having to put them all in one by one would be a huge pain. Luckily they thought ahead and prevented this almost entirely. The app itself that you preinstall before you get your Coin is also really nicely designed and simple to use. Unless it breaks, but more on that later. You can really easily see where all your cards are, add and remove cards, and add new cards with ease. There is even a way to contact support right from the app itself. Syncing with the physical card is very simple, you just hold down the button on the card until it says “SYNC” and tap the sync button within the app, and you’re done. Speaking of support – although only email is available right now they have been pretty good about getting back to me in a timely manner and making sure that my problem was resolved. The latest it took someone to get back to me was a whole day. That’s pretty good. I can’t speak for those of you who have issues with shipping or ordering but once I got my Coin I have no complaints about the service so far. Coin works just like a credit card. They swipe it, you enter your PIN if necessary, and you leave the store with your stuff. It really is a card that holds a dozen cards. It works exactly like it’s been described and as long as the cashier doesn’t swipe it wrong, it will usually work depending on the card reader. Lets talk about the bad aspects of Coin. To start off – and probably the most important part of the whole equation – is that it just doesn’t work in too many places. I live in a college town where you would expect the mom and pop shops to at least have a little bit of a grasp on technology but the honest truth is that many businesses still use really old card readers, and Coin is not compatible with them. I went to 10 different places so far using Coin and only 4/10 accepted the card and used it flawlessly. One location it took about a dozen swipes before it went through (the cashier was cool with it though, she just wanted to see it work), one location refused to swipe the card without even trying because they said that the machine wouldn’t take cards without numbers on the front (what?) and the other locations just had old card readers that Coin didn’t work with. I kind of felt like I was a time traveler who had to deal with having technology at my fingertips that, while it worked really well, was just too advanced for the rest of the world. All sympathy for my time traveling aside, the places that didn’t work were normal places like a cafe and a parking permit office. Oh well. 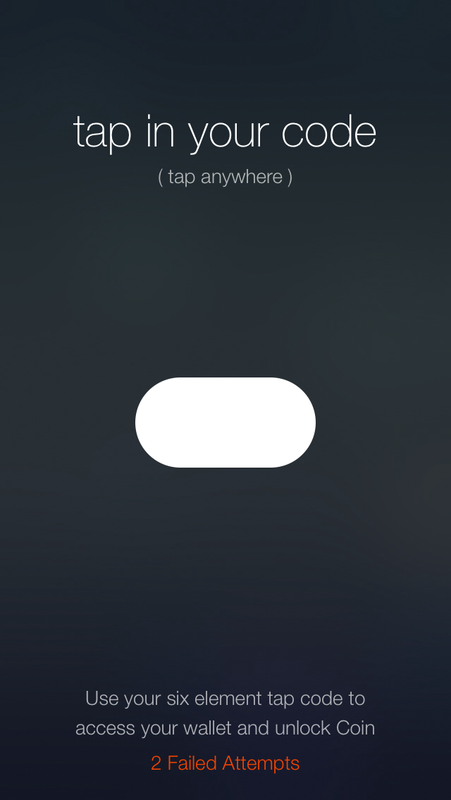 Moving on – Coin is always in lock mode unless your bluetooth is in the “on” mode on your phone. This means that your battery life is constantly being drained on your phone to the point where you need to keep turning your bluetooth on and off each time you want to use the Coin when checking out – and it still takes about 5-10 seconds for Coin to recognize your phone and unlock itself – not good if you’re in line to pay and the people behind you are wondering why you’re on your phone instead of handing the cashier your card. I haven’t found a way to bypass this security feature and thats probably because it’s required. UPDATE: You can unlock the card by entering your morse-code on the Coin card itself if it is in lock mode. Which means that you do not need to carry your phone with you the whole time, or have Bluetooth on. You have three attempts to do this until the card locks and you need to manually unlock it from your phone. Also – I haven’t been able to figure out how to pay via NFC yet – but I only got to try using it once. We will see how this works once I find a card reader to test it out with. The card wears very easily – there are already multiple visible scratches on the surface of the card that don’t rub off even after cleaning it. 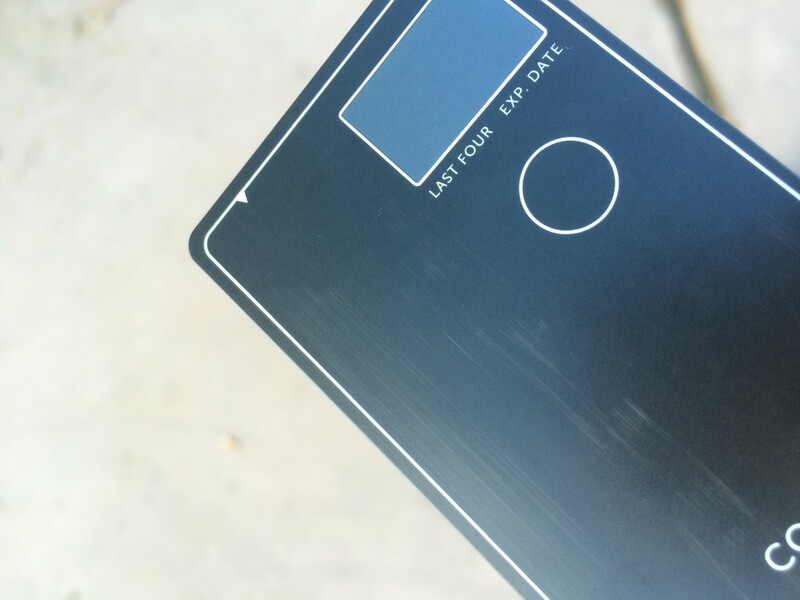 I know this is a petty complaint but I figured I would point it out since your $50 card won’t stay flawless as you use it – it is very susceptible to wear since it is being swiped through the card readers over and over. We will see over time if this affects the magnetic strip. This is the wear I’m talking about – after just a few swipes there are already visible scratches on the surface. Remember in the promo video when the guy effortlessly taps on the circle button on the front of the card and it swaps between each of his cards with light, easy taps? Yeah – that was probably edited in. The button makes a distinctive clicking noise and is not like the surface of a smartphone – as the video may give the impression. You need to apply force on the button for it to work. The app itself is called “Coin” – and it breaks sometimes. When first registering I ran into the frustrating problem of being unable to delete a card – until I realized that the app was broken and wouldn’t even let me select a card at all. A simple closing and reopening of the app fixed the issue – but it was still frustrating trying to contact support and thinking the whole time that I was incompetent when it was the app all along. I haven’t been able to replicate this issue so it may be an issue just with signup, but the app occasionally takes a while to open up if you enter your passed using TouchID. extraterrestrial being… thats how this goes down most of the time. As I see this feature I can’t help but wonder “who thought this would be a good idea?”. Complete nonsense. Worst idea ever in my opinion. Why can’t it just be numbers? So there you have it, the complete review of my first week with Coin. Was it worth the $50? I’d say it was. It’s cool enough and turns enough heads that it makes up for the fact that it doesn’t work everywhere. Most of the issues I had with it weren’t the device itself, but the app, the old card readers at stores, or easily fixable issues such as always having bluetooth on (just need a phone with better battery life – I’m looking at you, iPhone 6s). Did you preorder Coin? Are you going to now? Did I miss something important? Let me know in the comments below or send me a message through the contact form or by emailing me. If you would like to purchase the Coin card, you can do so through their website, or through their product page on Amazon (both are the same price). Thanks for reading – and if you enjoy stuff like this you’ll enjoy the newsletter where you can stay up to date with all the cool developments happening here at Wiyre.